Ellen Lambright mourned when her best friend, Mandy, moved from Indiana to Hawaii. But now Ellen has received the Amish church’s permission to go to Hawaii and help Mandy through challenging times. Rob Smith works on the Williams family’s organic farm, far from his past mistakes and burning regrets. When Ellen befriends Rob, the attraction is mutual, but her commitment to the Amish faith stands between them. Could a heartfelt discovery lead to forgiveness, reunion, and love? Or is Ellen’s destiny waiting for her in Indiana? 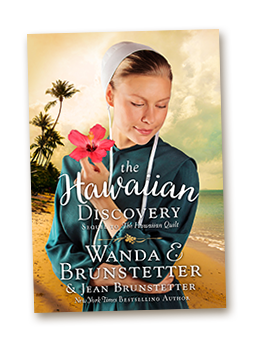 Find out in this sequel to The Hawaiian Quilt from New York Times bestselling author Wanda E. Brunstetter, writing with her daughter-in-law Jean Brunstetter. Join Mandy and Ellen on a trip of a lifetime to Hawaii in this two-novel collection. Will the discoveries these Amish girls make forever change the direction of their lives? Mandy Frey has always longed to see Hawaii, so before joining the Amish church and settling into family life, she convinces three friends to join her on a cruise of the Hawaiian Islands. When Mandy and Ellen miss the ship after a port of call on Kauai, they get a room at a bed & breakfast where they make new friends, learn about local history, and participate in Christian church. But when it is time to fly home, Mandy feels torn between feelings for Ken Williams, an organic farmer on Kauai, and Gideon Eash, her boyfriend who has been waiting for her in Indiana. Ellen Lambright thought she was going back to Hawaii only to help her best friend through multiple challenges, but she also befriends a man who has been hiding from his past. Reuben Zook works on the Williams family’s organic farm, far from his past mistakes and burning regrets. The attraction is mutual, but Ellen’s commitment to the Amish faith stands between them. Could a heartfelt discovery lead to forgiveness, reunion, and love? Or is Ellen’s destiny waiting for her in Indiana? After my daughter-in-law Jean and I wrote The Hawaiian Quilt, readers began asking us if there was going to be a sequel. We talked about the possibility, and soon our thoughts took us to the Island of Kauai, as we began plotting for a second book—The Hawaiian Discovery. 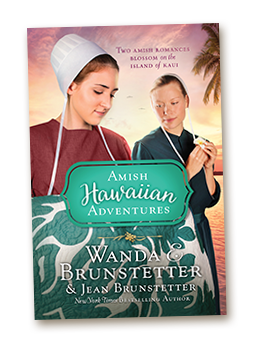 Since Jean and I have visited the Hawaiian Islands several times, and have seen a correlation between the Hawaiian people and our Amish friends, we wanted to show the differences, as well as the similarities in this book, which focuses primarily on Mandy’s friend, Ellen Lambright. There are many things to be discovered on the Island of Kauai, and we hope our readers will enjoy reading about the discovery Ellen made when she went there to help Mandy during a crisis.